Michael Jackson's children stole the show at Monday night's Grammy awards when they accepted their father's lifetime achievement award. The recluse children have been largely out of the public eye. Yet, young Paris, Prince Michael, and Prince Michael II (aka, "Blanket"), have lived in some of the world's most lavish homes. Michael Jackson's last place of residence was a rental home in the Holmby Hills area of Los Angeles which he rented for $100,000 a month. The Jackson Family's ascent in the music world is well-documented. 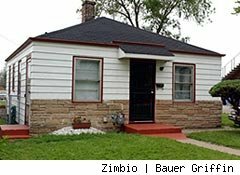 Humble beginnings gave way to ever-larger successes, and, by extension, ever-larger homes. 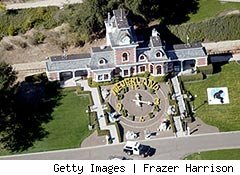 But Michael Jackson's most famous abode was his Neverland estate. He purchased the land near Santa Yenez, California, in 1988. The construction cost for the home in 1989 was $17 million. Among other things it boasted 16 amusement park rides, a menagerie, and movie theater. A staff of 40 security guards manned the property. Neverland (below)was the first home Paris, Prince Michael, and Blanket ever knew. The children reportedly lead a nomadic life after excessive debts drove Michael Jackson from Neverland. Jackson reportedly defaulted on a $24.5 million loan meant to save Neverland in 2008. The compound's future remains unclear. 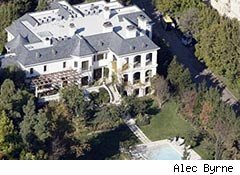 Jackson and his children rented the Holmby Hills mansion in Los Angeles prior to his death last year. Photos of the OTT French Chateau interior design can be found here. After his unexpected death last year the children moved in with their paternal grandparents. It's difficult to guess where the Jackson offspring might live next. Currently, Paris, Prince Michael I and Prince Michael II are living in an undisclosed location in Encino, California. Michael Jackson's mother, Katherine Jackson, was seen recently purchasing sleeping bags and children's toys.